Providing they don't suffer any delays (which with such a complex compact site and depending how harsh this Winter might be its quite possible) I'm still confident that they will have it finished for Summer 2019. Klugheim still majorly looked like a construction site until nearer to opening. It's far too early to be predicting a 2020 opening - lets see how things progress in the next few months first. On CoasterFriends.de Roff has edited this drawing to show the new track pieces (marked in pink). Orange marks the two launches. b&mfanboy123, Bert2theSpark, Hixee and 5 others like this. Well, we don't know how much of the already built track will be part of the first section. I'm thinking that the part with the helix will be most certainly before the second launch, because it is too tight for the higher speeds..
and then there's the 150m that are definitely before the second launch, because the track is already connecting there. So i don't think a lot of the track that will be built in the top left part will be for the first section of the right, but rather for the second. I believe the assumption/prediction was made on the basis that they would struggle to fit much more in. Slowly but surely they're running out space! But of course no one can say for sure, simply need to wait and see how much more they pack in there. mrrc, Yoris Kerkhoff and CoasterCrank like this. It's pretty amazing how they've seemingly progressed so far since the corkscrew first went up and we still are relatively clueless as to what the final product will become. This is arguably the most exciting project for 2019 for many of the same reasons as Harry Potter - there's so much mystery surrounding it. The construction process is a ride in itself. TilenB, Coaster Hipster, Steel & Story and 7 others like this. the off-season started so I've got some time So I tried to do my own recreation of the layout with the help of all images I could find. Especially looking at the supports helped a lot to determine where the track actually is located. It is very similiar to the one of Roff but at some points our perspective varies. Also I changed the color of the track into two different ones to distinguish the part after the first launch and the one after the second launch. Steel & Story, Pokemaniac, PetskuC and 13 others like this. Vekoma's new website now features the new generation flying coaster model. According to which an announcement of the model shall be made soon. On this really unique ride, riders are comfortably and safely harnessed in a prone position. Riders start in a sit-down position and are transported sideways to a dark ride section. They are immersed in a story to save the world using their flying super powers. Prepared to get launched, the track and seats are turns 90 degrees creating a smooth transformation from dark ride to flying coaster from where the flight begins and riders experience inversions, air time moments, near miss moments and a lot more. With their arms stretched out, face down and parallel to the track, this is as close as it gets to flying like superman! The combination of the different positions of riders, creating a free view dark ride section in combination with a thrill, makes this ride type a one of a kind in the roller coaster industry. hey--hey-ho, EpochEmu, Pear and 3 others like this. Not directly about F.L.Y. but Vekoma has completely revamped their website in preparation for IAAPA 18. This includes their new branding and logo and also... a "soon to be announced" next gen Flying coaster concept! mrrc, Pear, Yoris Kerkhoff and 4 others like this. And while this has nothing to do with F.L.Y., this new SLC (Or STC, suspended thrill coaster as they're calling it now) is very interesting! 10 rows of 2 seats just like the test train. Must say the train in this concept art image looks great - really well styled/themed. They even have small wheel covers. Makes me very intrigued to see what the theming of F.L.Y. 's trains will be like. Yoris Kerkhoff, Steel & Story and Coaster_Greif like this. "Thunderbird is a new, exciting and extremely smooth Suspended Thrill Coaster. This new suspended family coaster based design with no less than 2 inversions, 5 airtime hills and 6 exciting twists and turns makes it possible to offer inversions for young and old from 1.20 m tall and up. Combinations of high speed turns and low force inversions prepare the small riders for the real work. This ride will thrill the seasoned rollercoaster enthusiast, but is equally fun and accessible to the youngest among thrill seekers." 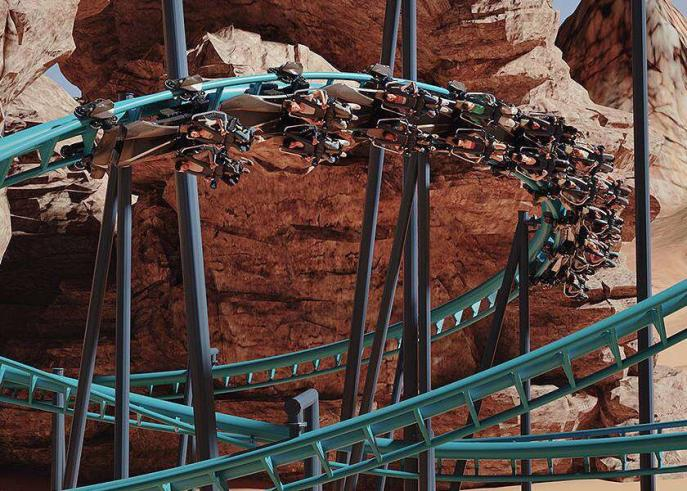 Just one thing - how the hell is this a family coaster?! In my opinion it's categorically not. hey--hey-ho, b&mfanboy123, Yoris Kerkhoff and 4 others like this. b&mfanboy123 and Yoris Kerkhoff like this. Yeah, we saw. The same stuff was posted in a few places, actually. Given that FLY is going to be a new flying coaster from Vekoma, I don't see the issue in it being posted here too. The majority of the discussion will take place over there anyway, 'cos we've got so many walls to look at! b&mfanboy123, Pokemaniac, Pear and 3 others like this. Personally think that the train looks a bit ugly in that promo image. Hopefully there's options for customisation and stuff. NGL I only see 9 rows - 18 riders per train. It is a bit deceptive, but there are 10 rows. The 9th (out of 10) rows is a bit obscured by the 8th - you have to look a bit, as it is easy to miss, but it's there. Yoris Kerkhoff, Steel & Story and CSLKennyNI like this. I marked the wheel chassis of every row. Not trolling at all, there are clearly only 9 rows of passengers. I think you count the person in the last row on the left seat as a separate row. I see that the rendering looks there a little bit confusing, but again: Just count the wheels, then it's very obvious.